The concept of planning and preparing 3 meals a day, 21 meals a week or 1,092 meals a year is pretty mind boggling when you stop to think about it. Doing it all while short on cash is even more challenging. This is where the art of menu planning comes into the picture. By taking the time to plan ahead of time we are more likely to stay within our budget and we are able to find ways to use up what we already have on hand. Using up food we already have is the best way to stretch limited funds. Essentially there are 3 different menu planning methods that work well when you’re on a tight budget. Your job is to choose the method that fits best into your lifestyle and then to stick with it. Meals are eaten whether we plan them or not. By taking the time to think things through in advance we control the cost, nutritional content and the time given to each meal. It’s the only way to turn 1,092 low-cost meals a year into a manageable task. The Night Before: This is the method that takes the least forethought. It provides the most control over waste and the opportunity to use up leftovers. Plan at least the dinner you intend to serve the next day and have a good idea for lunch. A Week, Fortnight or Month at a Time: I prefer to plan a fortnight at a time. Others prefer to plan for a week or month. Whichever timespan you choose the process is the same. This method allows you to take good advantage of weekly supermarket sales. It requires you to shop once a week. Rotating Menus: When you are seriously pressed for time and your family is very picky, this is the best method to use. You plan out 10 to 20 complete menus and then rotate them, serving a different one every day. It limits variety, but there are no surprises. Since you are so familiar with each meal you are able to prepare it more quickly, or make and freeze several batches at once and spend the least amount of time in the kitchen. Ask the kids and other family members what they like while you’re making out your list. If necessary you can subdivide the Main Dish category into Chicken; Beef; Beans etc. The next step is to go through your list and highlight all of the dishes that are budget friendly or that can be adapted to be easy on your budget. These highlighted items will be placed on a new list. The new list is your Master List. Just in case this is beginning to seem like a lot trouble, let me encourage you don’t give up yet. This activity may take as long as 2 hours but it will save you so much time in the long run that it is clearly time well spent. Ribeye Steaks & Grilled Shrimp will not be on the new Master List. Oven fried chicken, all the good casseroles, ground meat dishes, favorite veggies, homemade breads and desserts will take center stage. If your new Master List is somewhat skimpy don’t despair. On this site you will find plenty of good tasting, well-tested, family-friendly recipes that will fill up your bellies while going easy on your wallet. Make a list of new items you would like to try, and plan to use them along with family favorites. If they turn out to be winners then add them to your Master List. When adding new foods to the family diet it’s best to go slow. An entire meal made up of new foods is likely to meet with disapproval from the whole family. Instead, try serving a single new dish in a meal that is full of familiar favorites. The new item will be associated with well favored dishes and is more likely to be accepted. You know your family’s likes and dislikes better than anyone else. You know what they are most likely to enjoy and what they will spit out with disdain. Use your knowledge wisely. If you already know everyone hates liver, then don’t try to make it acceptable to them. It’s a waste of time. The same goes for Brussels sprouts, lima beans and anything else that you know they dislike. Buying food that you already know the family won’t eat is always a huge waste of money. Instead, try to plan around their likes and dislikes within reason. There’s a balance between catering to juvenile whims and feeding them liver and gruel for every meal. As the family menu planner, your job is to find that balance and navigate it with maternal skill. This method is the best way to make use of leftovers and seasonal abundance. Begin by allowing yourself some “mulling time”. You’ll need 10 minutes or so to think exclusively about the contents of your cupboards and what you feel like cooking the next day. Most women use their evening dishwashing time for this purpose. As you fill the sink with warm, soapy water, think over the contents of your fridge. Perishables are the first thing to be used up. Is there baloney in there that got lost in the back of the fridge and now needs to be used up? What about fresh veggies that have spent the week unloved and unappreciated in the crisper drawers? Did the cheese grow a few spots of mold? For this scenario, I would trim the mold from the cheese and plan on fried baloney and cheese sandwiches for lunch the next day. Any vegetables that could be chopped up and eaten raw would go into lunch boxes, and the remaining vegetable would be served at dinner. It is almost like a jigsaw puzzle. Perishables are the corner pieces. You arrange them first, and then fill in the blanks with pantry and freezer items. Lets take a look at another scenario. In this one there is broccoli leftover from tonight’s dinner and the cupboards are looking kind of bare. There are some chicken leg-quarters in the freezer gathering frostbite and a few staples like flour, rice, and canned tomatoes. What can be done with these things to fill up a hungry family and avoid that sad feeling of deprivation that comes from empty cupboards? Well, let’s start with the broccoli. It can be used by itself or in conjunction with the chicken. Chicken and Broccoli Casserole or Garlic Chicken and Broccoli would both be nice. The casserole would need less chicken, but it would have to be boiled in the morning so you would have cooked chicken for dinner. The recipe calls for canned mushrooms and cheese though, and our kitchen is bare of such luxuries at the moment. Garlic Chicken and Broccoli calls for fresh garlic and we only have garlic powder. Plus it calls for a full pound of broccoli and we only have half a pound. Don’t worry, we’ll replace the fresh garlic with 2-teaspoons of garlic powder and use that half a pound of broccoli plus some chopped up onions or carrot to make up the difference. Since there is still a bag of flour on the pantry shelf, add some homemade muffins or biscuits and make some iced tea to serve with supper. Or, suppose someone in the house is allergic to garlic. What could you do instead? The next morning go to work as soon as the breakfast dishes are washed. 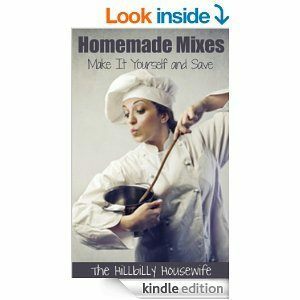 Use the flour to make homemade tortillas while you simmer the chicken on the back of the stove for an hour or 2. Let the chicken cool and pull the meat from the bones. Strain and chill the broth for soup another day. Saute a few onions in a skillet. Add your tomatoes and cooked chicken along with some chili powder, salt, and pepper. Simmer it until it’s thick enough to fill soft tacos or burritos. Meanwhile marinate the broccoli in italian dressing for a few hours, alone or with any other fresh or frozen veggies lurking about in minute amounts. Prepare a pot of plain or seasoned rice to make sure all the empty tummies are filled. Tah-Dah! You have chicken burritos, rice and marinated broccoli salad for dinner. And you thought the cupboards were bare didn’t you? This thought process should happen fairly quickly once you get the feel for it. At first it may take as along as 15 or 20 minutes, but soon it will become second nature. You’ll face kitchen crises like bumper zucchini crops, turkey leftovers (again! ), and cupboards that at first glance seem empty and bare. Don’t despair! You have a good brain and a vested interested and before long you’ll be able to plan for tomorrow without any trouble. A quick note, some women feel best if they write their plan down on paper, others are able to keep it in their brains without losing it. I recommend writing it down, especially at the beginning. This makes it concrete and tangible instead swirling around in the nebulous ether of a busy mother’s brain. This is my preferred method. It takes immediate advantage of weekly supermarket sales and allows adaptations for seasonal abundance. We get paid every 2 weeks, so I try to plan a full fortnight at a time. While this method requires more planning time initially, it is only done at intervals. The total time used is much less than the method described above. This method can be arranged to accomodate store advertisements and sales, or it can make use of the food you already have on hand. I’ll describe the processes for both and you can adapt it to fit your circumstances. Supermarkets advertise their sales once a week in the local newspaper. Seasonal items and loss leaders are ususally the best deals. Loss leaders are meats and produce that the market puts on sale at or below their own price. They make very little profit on these items. The reason they are willing to take this loss is because the loss leaders are bait designed to draw in unwary shoppers. The markets hope that you’ll stop in for their huge sale on strawberries and pick up some sugar and whipped topping, both of which happen to be priced higher than normal this week. They may advertise hotdogs for the 4th of July and then mark up all of the ketchup, mustard and buns. Around Thanksgiving turkeys may be offered at give-away prices, but cranberries are double what they will be in another 2 weeks, fresh potatoes have tripled in price and stuffing is 50¢ more than it is during the summer months. Your job as a consumer is to become aware of these pitfalls and sidestep them the way you sidestep the children’s trainset on your living room floor. The supermarket builds hazards into the shopping experience, hoping that you’ll succumb to the latest gimmick. Making out a menu plan gives you a psychological edge over the grocery store. You know what your family is going to eat for the next week or month, and that goes a long way towards building up your resistance to the supermarket’s temptations. Begin by finding a full hour of relatively uninteruppted time. Arrange the local supermarket advertisements to your right and a pencil and paper to your left. A cup of tea or coffee and homemade muffin nearby makes the process run more smoothly. Look through the ads. Make note of the loss leaders at each store. This will be meat or seasonal produce that is priced unusually low. Think about the meat and produce on sale. Does your family like any of it? Will they eat it? If it’s something they love can you buy extra and freeze it for later? Do you have a nearby store that will match advertised sales from other stores? If so, shopping that store will save you gas and time. I know Walmart will match other store’s ads if you bring them in to show the cashier. Since they sell the staples I normally buy anyway, for less than most of the other stores I might add, it’s the one that usually earns my patronage. Lets assume that cabbage, onions, apples and boneless pork chops are on sale this week. Even on sale, the porkchops are out of my budget. Instead I fall back on the old favorites of dried beans, ground turkey or beef, turkey ham, canned tuna and chicken leg quarters. The cabbage, onions and apples are genuine bargains, so I plan to use them several times during the week. Now I put away the ads, and take out the Master List I made up above. Looking through my Master List, I determine which meals we haven’t had recently and which ones make use of the items I’ll be buying. Turkey ham cooked with cabbage and potatoes would be yummy. Hmm, better check the potoato supply, yes there are plenty. So Turkey Ham, Cabbage & Potatoes are my first dinner menu. They have to cook for about an hour and the prep time is minimal, so I’ll plan it for Tuesday, when I know I’ll be able to watch it while I work on household chores. I want to use as much cabbage as I can since it’s so cheap, so I’ll figure on coleslaw at least twice. Tuna Casserole can be made ahead of time and reheated, so it will be good on Thursday, my busy day. I’ve got a 10-pound bag of chicken leg quarters in the freezer that I’ll try to use it up later in the week. Monday is a big work day in homeschool, so something relatively easy is in order. Dirty Rice with ground turkey or beef will be nice, but I’ll have to use celery instead of green pepper because it’s out of season and outside of my budget. Wednesday is a slow day at school and I’ll be baking anyway so beans will be good. While I’m at it, I might as well make enough for chili the next day. I have time for making chili on Thursday morning while the kids are doing their independent reading. Leftovers can be lunch the next day too. Over the weekend I’ll thaw and cook the chicken. Friday I’ll serve oven fried chicken and mashed potatoes. The rest of the chicken will be boiled and removed from the bone. Then it can make chicken salad on Saturday and a big chicken casserole for the potluck at church on Sunday. A nice byproduct of boiling chicken is the broth. It will make a yummy soup for Saturday night. Since I have to cook on Saturday afternoon anyway, preparing for the potluck, the soup won’t take any extra time. Lunch and breakfast are filled in using products I know will be affordable. Tuna, baloney and peanut butter make good lunches. Hot cereal is inexpensive for breakfast and frozen concentrated orange juice is always cheap and nutritious. The apples on sale are evenly distributed throughout the week. Bananas are usually cheap too. For the rest of the fruit I’ll fill in with canned favorites or seasonal fruit that wasn’t advertised. On Wednesday, when I bake, I’ll make 6 loaves of bread, 2 dozen rolls, oatmeal cookies and lemon bars. That may seem like a lot, but when all is said and done, it will only take about 3-1/2 hours. The labor will pay off for the next 7 days. Next I check over my staples; rice, flour, pasta etc. I note anything running low and jot it down on my list. By looking at my menu I can see that I’ll need to buy 2-pounds of ground turkey or beef, 4 cans of tuna & 2 pounds of turkey ham. I still have baloney and peanutbutter, but I will need mayonnaise. Carrots and celery are inexpensive and will both go on my list. I need a small cup of yogurt for starter and a new box of oatmeal too. Any other extras I fill in as I go. When my list is complete I can go shopping. The menus go on the refrigerator so the kids know what to expect during the week. The entire planning process will take at least an hour at first. After a while it can be pared down to about 30 minutes. The Master List of family favorites really cuts down on the time it takes to put menus together. Weekly Menus based on foods already on hand. But what if you have to go for the week without a trip to the supermarket, or maybe you’ve only got $20 and need to make it through the week. No problem. Once again, you’ll need about an hour to do your planning. First look through your freezer, cuboards and refrigerator. Make note of any perishables, and then list the other foods you have under the categories of Protein, Veggies; Fruits & Starches. For our example there is peanut butter; lentils, white beans; canned salmon, a can of spam-type luncheon meat, 2 pounds ground beef and a frozen chicken in the protein category. Veggies are onions, potatoes, carrots, canned corn, tomatoes, tomato paste, and green beans. Fruits are applesauce, pineapple, canned peaches; frozen apple juice and grapefruit juice. Starches include spaghetti, rice, oatmeal and cornmeal plus plenty of flour. A check of the dry milk situation shows that it is very low. If there is any money to spend, this is where most of it will go. Eggs are running low. They would be my next priority after dry milk, but even this can be overcome. Baloney and a package of sandwich cheese would also be nice for lunches, but not necessary. The menus will begin with protein. Lentils and rice make delicious burritos and the white beans make baked beans and bean and potato soup. Baked beans should be on made on a day I’ll already be in the kitchen. As I mentioned above, Wednesday is my baking day, so baked beans are best made then. Leftovers will make an easy lunch on Thursday. Monday will work for chicken, which will be roasted with carrots and potatoes. The leftover chicken can be picked from the bones, and the scraps boiled for chowder on Tuesday. Tuesday evening salmon patties and batter bread, which is made from cornmeal, make good use of items already on hand. Fried Spam is quick and easy on Thursday. On Friday lentils and rice are delectable with homemade tortillas and a nutritious sidedish of tomatoes. Since Saturday is another day in the kitchen and around the house, white bean soup will be easy to keep an eye on. Hoecakes cost next to nothing and everyone loves them. On Saturday and Sunday the family gathers for lunch together. Special meals at this time make everyone happy. Spaghetti is quick and nutritious while Hamburger Gravy extends a pound of ground meat far enough for Sunday guests. Carrots make lovely salads with raisins on Wednesday and Thursday and again on Sunday with canned pineapple. Economical desserts include cinnamon oatmeal cake baked along with the chicken on Monday, and then Snickerdoodles and Gingerbread later in the week. On Wednesday, baking will include 6 loaves of bread; Whole Wheat Muffins; Snickerdoodles and Gingerbread. These can bake alongside the baked beans which will be in the oven most of the afternoon. Desserts round out the empty places in growing children, and hard working husbands, especially when meals may be a little on the skimpy side. It’s not ideal to fill up on homemade gingerbread or snickerdoodles, but it’s more wholesome than a lot of alternatives. For breakfast I’ve relied on hot cereal as much as possible. It’s cheap, easy on the cook and filling. Since fruit juices are a bit lacking I’ve made use of tomato paste to make tomato juice. Not everyone loves Tomato Juice like I do. Try sparking it up with a dash of Worcestershire Sauce or hot sauce. It’s surprisingly refreshing early in the morning. Lunches are filled in with leftovers and PB&J sandwiches. If there were more eggs I’d add boiled eggs to the white sauce on Wednesday’s lunch. If I was able to buy dry milk, then I would add reconstituted milk to breakfast and lunch menus. This plan may seem more elaborate than you would make on a week when there’s no money for groceries. If you really think about it though, that’s the whole idea. Good meals are vital in order to avoid those mournful feelings of desperation that can sneak in when everything seems to be going against us. By planning the menus in advance, we’re able to make sure that limited resources are evenly spread throughout the week. We’re also able to assure the menus are as nutritious and delicious as possible. Probably the most expensive, but also the least time consuming, rotating menus are ideal for women who are extremely pressed for time. Take the Master List that you’ve already prepared; go over it again and make sure that all of the meals use foods that are consistantly low cost. Click Here to see my list. Pair up main dishes with side dishes, breads and fruits. Create a total of 10 to 20 meals. Type or write up your menus and then use them as the basis for your grocery list. Prepare and serve the menus one after the other. When you have used up all of your menus, go back to the beginning and repeat them. If you like to do Once-A-Month-Cooking then this system is perfect for you. Casseroles, Chili and other things can be prepared in quantity and frozen for later use. Crock-Pots can also be used to good advantage with this method. In the example above I have tried to accomodate a variety of flavors while using inexpensive staples that will keep well in the fridge, freezer or on the pantry. The only exceptions are Green Salad and Coleslaw which can be made from lettuce and cabbage at home, or purchased ready made at the market. Biscuits can be canned or made from scratch. Muffins can be replaced with toast or canned biscuits to save time if desired. Since you are preparing the same meals over and over again, it becomes even more important that you choose foods the family really loves and is unlikely to tire of. If they begin to dread any meal in particular it can be retired and a new one can take it’s place. In my example Shake N’ Bake Pork Chops could be replaced with Lasagna when the family can’t stand to see another slab of pork. The side dishes can remain the same. Spinach and applesauce both go nicely with lasagna, and the noodles can be replaced by garlic bread. Lasagna is easily prepared and frozen on a mega-cooking day, as is Tuna Casserole, Chili, Meat Loaf, and Country Style Steak. Using this technique prep-time can be so reduced that it’s almost nonexistant. I have omitted lunch and breakfast menus in the example above. They can be based on the same principles. You may only need 3 or 4 favorites for breakfast but lunch is best treated to the same variety as dinner. If needed you can fill in the menus with inexpensive store-bought cookies, homemade iced tea and reconstituted milk. This method is the same that most institutions like hospitals, school lunch programs, and nursing homes use to plan their meals. Be sure to make all the meals nutritionally adequate because if the family isn’t getting their nutrition at home, they probably aren’t getting it at all. 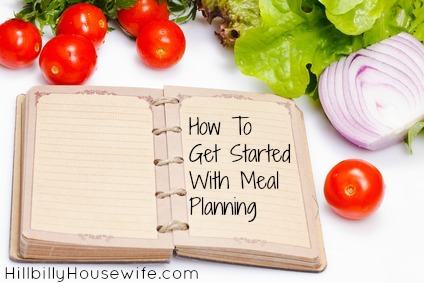 Remember, menu planning is supposed to be a time and money saver and a nutrition booster. Sometimes we have to follow through with the process and then stand back and trust it to work. If we’re unaccustomed to planning menus, it can seem odd to rely on a piece of paper to tell us what to cook each day. This feeling will pass with time as we grow to rely on these plans. I’ve found that it is a relief to know that I don’t have to worry about dinner every night. The security of already knowing what we’ll eat, not only for this day, but for the rest of the week allows me to use my mind to focus more clearly on other projects that require my full attention. Knowing that everyone is well fed and well cared for gives me the opportunity to do a better job at the rest of my responsibilities. Plus, it saves so much money along the way. I’d also like to invite you to grab a free menu planning basics report at MenuPlanningCentral.com – they also offer a meal planning service I can highly recommend.